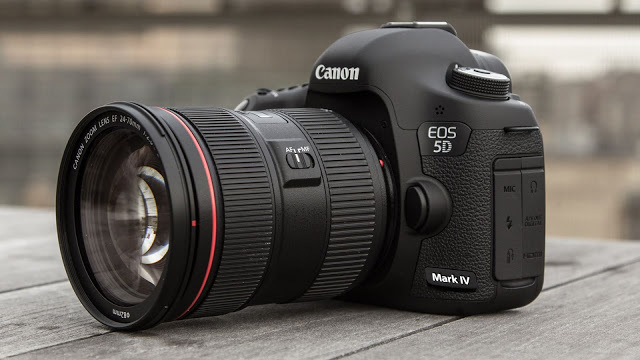 The Canon EOS 5D series is arguably one of the must recognizable camera lines of the digital age and the Mark IV is designed to appeal to the same wide range of enthusiasts and professionals. Nearly identical-looking to its predecessor, it receives substantial upgrades under the hood, including a higher-resolution sensor with Dual Pixel autofocus, 4K video capture, an upgraded AF system, a touchscreen, improved weather-sealing, built-in Wi-Fi/NFC and GPS. All this adds up to a camera that fits into Canon's product line nicely as the all-around full-frame option. 4K video capture is a welcome addition to this camera and users can record in either 24 or 30p, albeit with a 1.64x crop. All footage is captured as Motion JPEG. Additionally, the camera allows for 4K Frame Grabs, effectively giving users 30 fps stills shooting with (Dual Pixel) AF. The usefulness of this may depend on how well-controlled the camera's rolling shutter is, and how acceptable 8.8MP, ~17:9 JPEGs are to you, but we've been impressed by how effective 4K/60p video capture on the 1D X II has been for capturing the decisive moment still. The 30.4MP chip offers a decent jump in resolution over the 22.3MP chip in 5D III. And judging from the improved dynamic range in Canon's other recent DSLRs (the 80D and 1D X II), we expect the Raw dynamic range in the IV to be much improved over its predecessor, which had some of the worst shadow noise and banding we'd seen in a modern full-frame digital camera. The improvement is thanks to the recent move to a design that uses on-chip analog to-digital-conversion, resulting in lower downstream read noise and therefore less shadow noise and better overall dynamic range at lower ISOs. In terms of AF, the increased coverage area is definitely a big deal: after all, its the exact same AF system found in the company's flagship sports camera. The 150,000-pixel RGB-IR metering sensor, which feeds scene information to the AF system, is borrowed from the original 1D X, bringing enhanced subject identification (including faces) and tracking ('iTR'), as well as improved metering and flicker detection. Unfortunately, we've found iTR to be too situation-dependent to be generally relied upon, and our initial impressions from our brief time with the Mark IV leave us similarly unimpressed at the camera's ability to automatically shift AF points to stick to your specified subject. Our impressions of Dual Pixel AF in live view are exactly the opposite though, with the Mark IV being incredibly good at sticking to the original subject (or face) you initiated to focus on. What's more, it's incredibly easy to specify your subject: just tap on it on the touchscreen in 'Face Detect+Tracking' mode, and the camera will stick to it like glue, no matter where it moves to in the frame. The 5D Mark IV is Canon's first full-framer that can continuously focus in Live View during stills capture, and because of the way Dual Pixel AF works, the focus is incredibly accurate, even with fast lenses. The 5D Mark IV also has some new tricks up its sleeve including Dual Pixel Raw, a nifty option that can prove useful in specific shooting scenarios. It works by recording two 30MP images, one from each of the 'left-looking' and 'right-looking' photodiodes at each pixel. Previous Canons have combined these two signals at each pixel, but Dual Pixel Raw gives you the option of keeping them separate. This results in a file that's twice as large, but one that allows for 'image micro-adjustment,' 'bokeh shift' and ghosting reduction (more on this on our Features page) in Canon's supplied Digital Photo Professional software. Canon now offers a range of full-frame models. On the high end you have the Canon's sports and action-oriented 1D X Mark II, with its 20.2MP sensor and 14 fps continuous shooting (with AF). The 5DS (and 'R' variant), with their 50.6MP sensors, are the company's high-resolution options. The 5D Mark IV splits the difference in terms of resolution and is positioned as Canon's all-rounder. For those on a budget, the compact EOS 6D soldiers on, four years after its introduction. Obviously, if you need the resolution, the Canon EOS 5DS is the more sensible choice. But in just about every other regard, the Canon EOS 5D Mark IV is the far more versatile camera and a worthy upgrade from the 5D Mark III.